San Francisco, July 24 (IANS) Hollywood actor Dwayne Johnson or “The Rock” has announced a new movie and guess who is his co-star? It is Siri, Apple’s voice assistant. 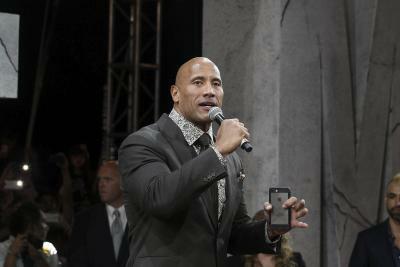 According to a report, in the Verge on Sunday, the movie titled “The Rock x Siri: Dominate The Day” is a collaboration between Johnson and Apple. This appeared to be an extended commercial, similar to what Apple did with Taylor Swift and Apple Music in 2016. Johnson also posted the poster of the movie on his official Facebook page saying it will debut on Monday. “I make movies for the world to enjoy and we also made this one to motivate you to get out there and get the job done. I want you to watch it, have fun with it and then go LIVE IT,” the actor wrote. According to The Rock, the movie will be “the dopest”. The movie would, however, not premiere on Apple Music, but on the company’s YouTube page and it would be for free.